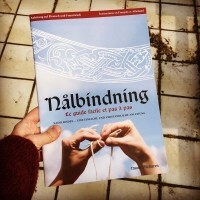 In the booklet we show step by step instructions on simple nålbindning techniques. The guide is designed to be used while holding the needle and thread in your hand and following the instructions one step at the time. With over 50 pictures in color, it gi ves you a clear and easy guide to this ancient craft and this, the fourtd and extended edition, also includes even clearer-to-follow patterns and instruktions on how to make wrist warmers, mittens and socks. The book is in both french and german, and there is also a version in swedish/english.